These cookies are outrageous and SO easy to make. They also made my house smell just like fall. 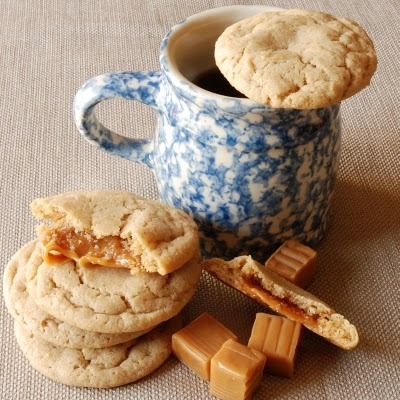 They are better right out of the oven or you can rest them on your cup to tea to warm the caramel in the middle. When you are ready to bake, unwrap your caramels. Scoop out cookie dough ball about the size of a walnut. (I used a rounded cookie scoop-full. My scoop holds about a Tablespoon.) Flatten the ball of dough slightly in the palm of your hand. Press the unwrapped caramel into the center of your dough and seal the dough around it, covering it completely. Place on parchment covered cookie sheets 2 inches apart. Bake 12-14 minutes, or until very lightly browned around the edges. Please don’t over-bake! Once the cookies are done, slide the parchment off of the baking sheet right out onto the counter. Allow cookies to partially cool on the parchment. When cookies are cool enough to be firm but still slightly warm, carefully twist off of parchment and allow to finish cooling upside down (either on the parchment or on a rack.) If you forget about them and they cool too much and stick to your parchment, put them into the freezer for a few minutes and they’ll pop right off.